Thus begins David’s journey into a secret that will live with him forever. It’s possible his journey will live with you forever as well. I was sucked into The Book Of Mistakes. I’ve begun to love fiction books, especially those with practical lessons the reader can discern from their reading. Today, I want to share some of my notes from and the first 3 mistakes in The Book Of Mistakes in the hope you’ll be able to avoid them and stay on the path to success. You wouldn’t think to ask an unemployed drug addict about success, but it can be an extraordinary opportunity. It’s amazing what we can learn from the most unlikely sources. Don’t approach only the successful in your quest for knowledge. Learn from those who are down and out. They have a unique perspective and have wisdom when it comes to what mistakes you need to avoid to be successful. Skip believes lessons are all around you and I. However, you have to have to be willing to seek out the lessons from others. A great way to do this is to ask great questions. What would you do over again? When you begin to ask questions like these, you get to look into the minds of successful and unsuccessful people. The answers they give open up insights into their path of success and how you can become successful as well. Be willing to ask great questions. David was captivated by the young woman he’d met. He couldn’t stop thinking about her and after finding the yellow sheet of paper with the instructions to meet at the café, David believed this would be his opportunity to connect with her. He was shocked when he discovered an Old Man at the café who began to pour into him wisdom about success. One of the first things the Old Man tells David is that the beginning is when you have more questions than answers. Isn’t that so true? Whenever you begin a journey, whether that’s leadership or marriage or parenthood, you have questions. Lots of questions. That’s okay. Be okay with knowing there’s a lot more you need to know. You’re wise to have questions about things you don’t know. 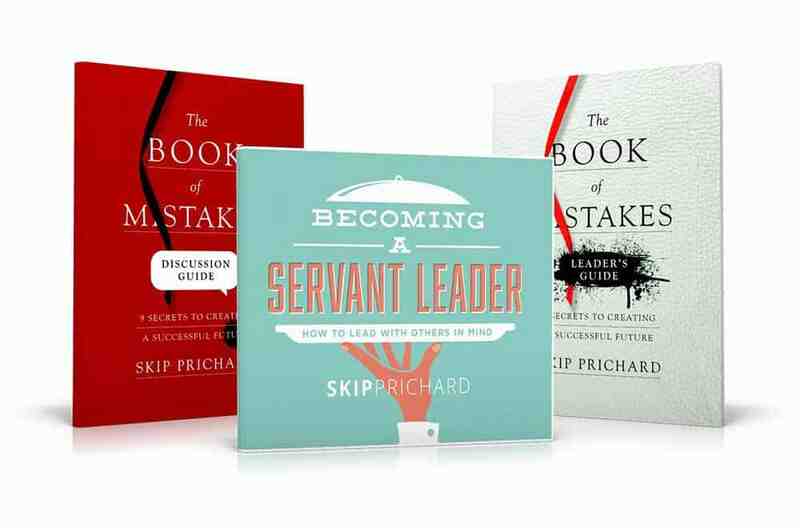 Find out the FREE bonuses you can receive for pre-ordering The Book Of Mistakes at the end of this article. The Old Man told David his capacity to absorb the wisdom he was about to gain needed to be absorbed. David was currently a full cup. To learn the next lesson, he needed to have room in his cup. David would meet the next person to teach him when he was ready. David would soon meet The Playwright. She was one of the most celebrated talents around. She also had a lesson to teach. Her roles had been written by someone else. The director told her what to do, where to be, how to act. She was playing a part. For her, something was missing. She didn’t feel whole. She knew there was more. This is when she considered leaving her role as an actor. She no longer wanted to fit into a story. She knew she had to CREATE her own story. You have a choice, same as The Playwright. Act in someone else’s story or create your own story. After meeting The Old Man and The Playwright, David meets The Banker. The Banker tells an interesting story about the value of a penny. A penny has a label. The label tells you and I the penny is worth one cent. However, the real value isn’t on the label. The penny costs far more to make than the value of its label. You have had labels placed on you. I’ve had labels placed on me. Shortly before reading The Book Of Mistakes, I’d attended a men’s breakfast at my church. We began a new series from Craig Groeschel called Altar Ego. The series talked about the *surprise, surprise* labels we’d been given throughout our lives. Jock, loser, stutterer, non-athletic, stingy, stupid… On and on, people have placed labels on you and me. We make a mistake when we begin to allow these negative labels to define our value. You are more valuable than the labels given to you. Don’t let others (or yourself) define your value in a negative way. You are special and you have something to offer the world. The next person David meets is The Trainer. He was physically fit and had a physique that would make most men jealous. The Trainer made contact with David by asking him how his workout went. David mumbled something back and The Trainer repeated the question. David’s response made excuses for the reasons he wasn’t as fit as The Trainer. That’s when The Trainer pulled David aside. He asked David if he could talk for a minute. Questions began to pour forth from The Trainer’s mouth. Each question was met with an excuse from David. This is when The Trainer drops the next mistake you need to avoid in life: Making and accepting excuses. 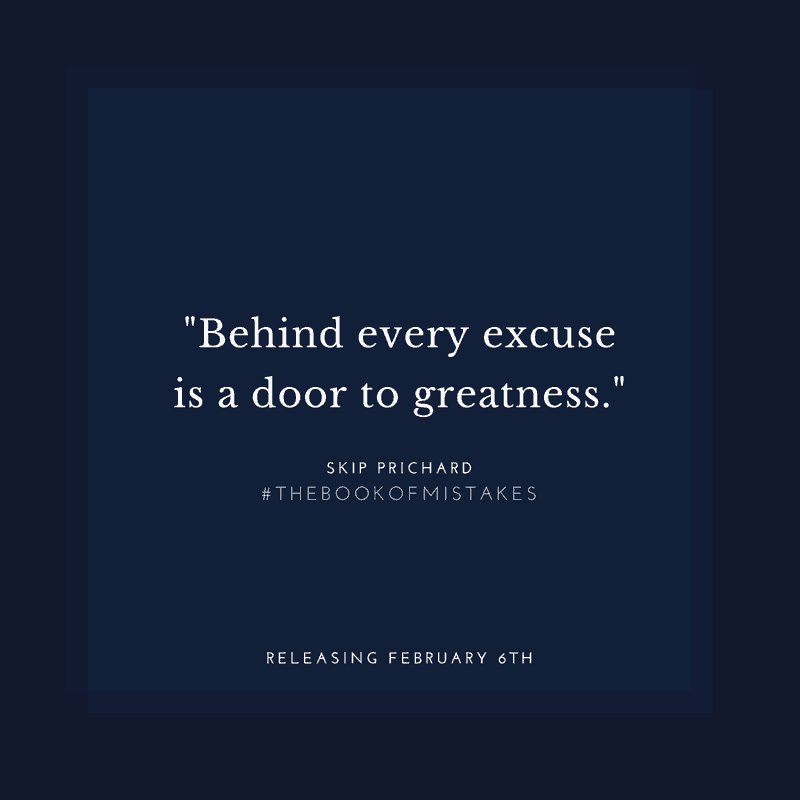 You can have a litany of excuses for why you’re not in better shape or why you haven’t gotten a promotion or landed a new job or found the right person. Finding excuses is easy. Finding a way to overcome the obstacles in front you, that is hard. I get out of breath walking from the car to the front door so I can’t run a half marathon! Yes, I’ve made mistakes. However, lots of other people have as well. They’ve been able to land a job. So can I! I may be out of shape. It takes a lot of work to get from the car to the door. Yet I can work on this. I can make it to the door with some effort. What would happen if I parked a little further away? Could I make it to the door? If I did, could I go further? Of course I can. And thus you begin to improve your health. Dyslexia may make it hard for me to read the words on in a book. It also makes it harder for me to write down words. But I don’t need to write the words. I can speak the words into dictation software that will spell the words for me. This will allow me to write the book I’ve always dreamed of writing. Don’t give into the excuses your mind easily comes up with. Instead, you can create a positive voice that will tell you what you can accomplish. Listen to your positive voice and accomplish your dreams! 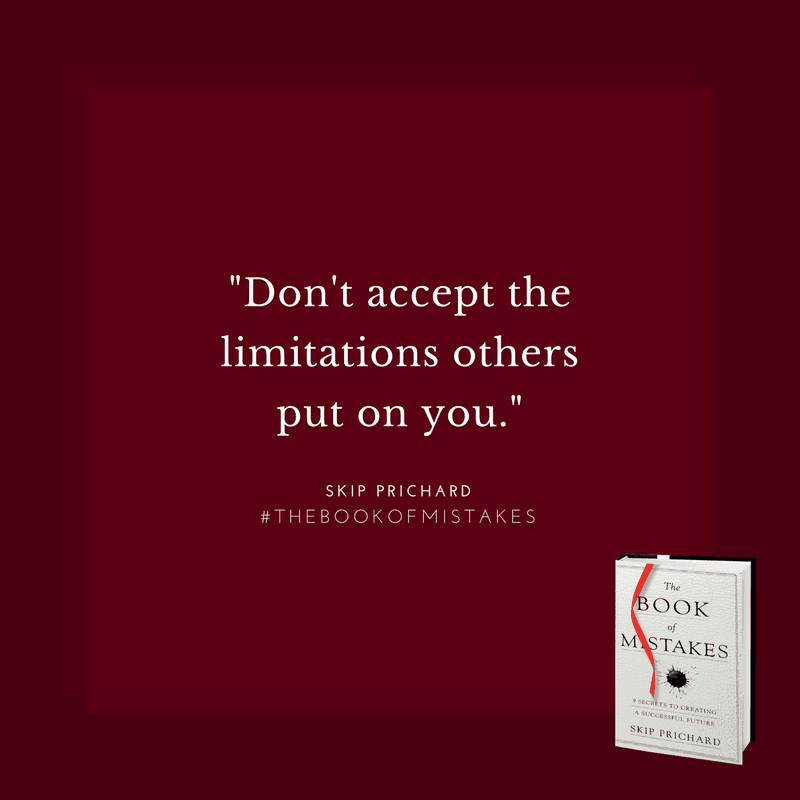 The Book Of Mistakes is full of practical wisdom you can use in leadership and life. There are still 6 more mistakes to avoid that I haven’t shared with you that is just as powerful as the 3 in this article. 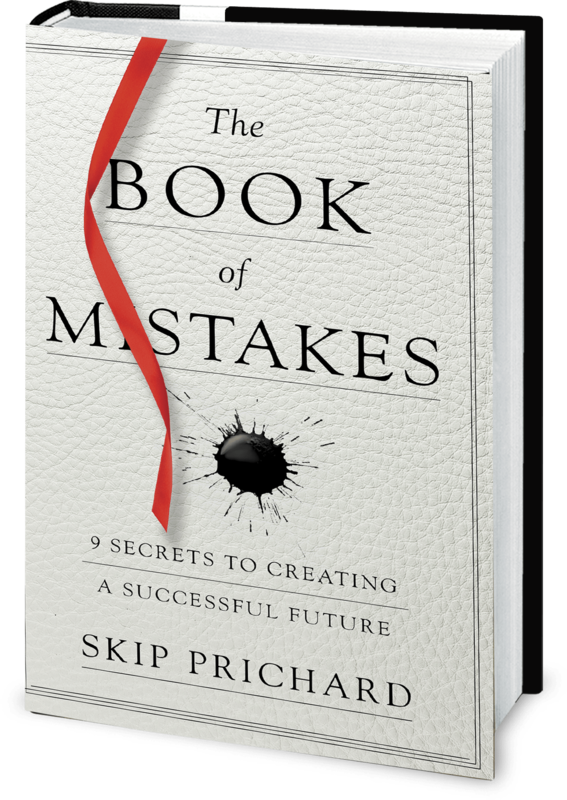 I implore you to pick up a copy of Skip Prichard’s book, The Book Of Mistakes when it releases on February 6th. You’ll discover the mistakes you must avoid to have a successful future. You won’t regret it. Question: What do you think the other 6 mistakes are in The Book Of Mistakes? Share your thoughts in the comment section below. Order 1-9 books and receive the bonuses below! Learn how to revolutionize your leadership approach and lead with others in mind. 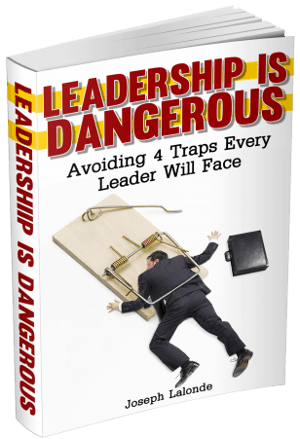 Also discover the biggest mistakes leaders are making and how to avoid them. The checklist developed by Jesse Lyn Stoner and Robert “Jake” Jacobs to help thousands change organizations. A free e-book excerpt from NYT bestselling author Tim Sanders and his book Dealstorming. Order 10 or more and receive these bonuses in addition to the individual package! Get a FREE audio version of this book by New York Times bestselling author and Forbes columnist Kevin Kruse, Kevin shares how to create massive emotional commitment among your direct reports. 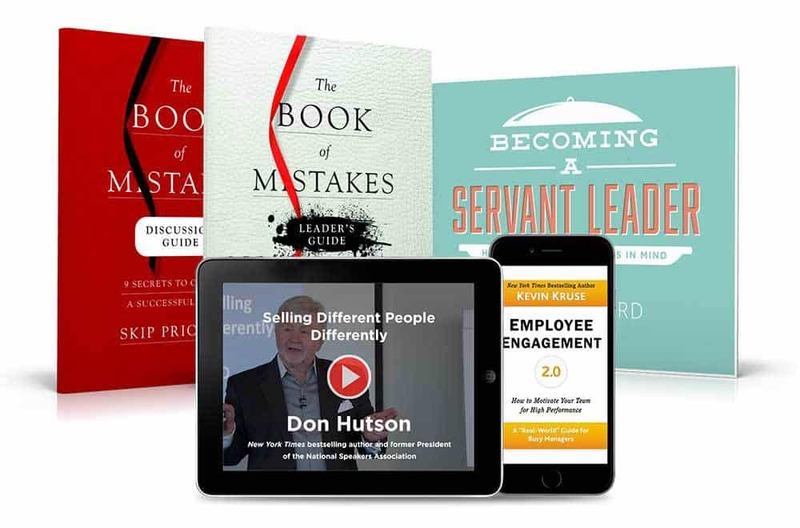 Get a FREE video by New York Times bestselling author and former President of the National Speakers Association Don Hutson. This valuable tool is one hour and retails for $129. Pre-order The Book Of Mistakes at Amazon and then head to www.thebookofmistakes.com to claim your free bonuses.